Well it has been a long time coming, but I was pleased to be told that Kyobi was finally released by Oberon Media today, and is now sat pretty on the homepage of MySpace Games. 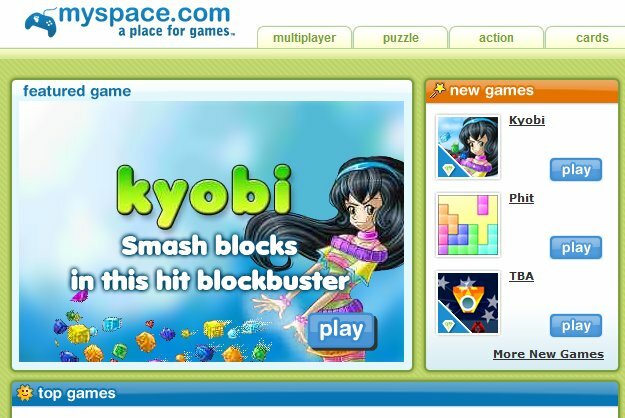 Oberon have been hard at work updating their game delivery system to support AS3 and MySpace is one of their first sites to carry AS3 games, of which Kyobi is their flagship title. Fruiti Blox is finally out! 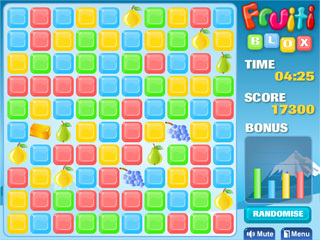 I finished my game Fruiti Blox back in December 2008 and sold it to Candystand.com. A few months went by and they still hadn’t released it. I asked them what the problem was and basically they were flat-out designing and releasing their new site. So Fruiti Blox got side-lined in the process. They are re-doing the graphics and branding for the game entirely so I can understand the delay. However part of the original agreement was that after 3 months I could release a viral version with ads. Obviously the game still hasn’t seen the light of day on their own site, so “3 months” was looking a long way off. I was always very happy with this game. The love and attention I poured into it paid off, so I was a bit upset that until now no-one got to experience that. Thankfully they agreed this situation was a bit pants, sent me an animation to use and said I can release now providing it appeared at start-up. I took a couple of hours, packaged it all up and now it has finally entered the wild! So you can now play Fruiti Blox on NewGrounds and Kongregate (ratings welcome on both!). It will start seeding fully over the coming weeks as it’s on Mochi Distribution and FGD. I’ve no idea how well it’ll go down on NG and Kong, but releasing it there is like one of those developer “rights of passage” tasks you have to put your fledgling games through. Some get flamed into hell and back, some limp out with mediocre ratings and a feeling of averageness, while on those rare occassions you may actually get some comments beyond “meh” and ratings beyond “1/5 – No zombies”. I’m guessing due to the fact you really do have to read the tutorial in Fruiti Blox (otherwise it just doesn’t “make sense”) that it’ll get slammed until it hits the more casual portals. Time will tell. Now Amiga mod replay has been done in AS3 before, most famously by Joa and Andre in the 8BitBoy Popforge library. And more recently in Flash Mod Player by Badsectoracula (although that is written in haXe it still compiles to AS3). But today I was blown away to receive a tiny zip package from the talented Christian Corti, lead developer at TrinityEffects. It contained a little test swf and a few class files named “flod”. Flod is his native AS3/FP10 Amiga Module playing library. And as you can hear, it plays very well! It has full support for 15/31 instruments and all the effects up to Protracker 2.3 including Inverse Loop (latest version, not the Funky Repeat), it also supports both Amiga A500 and A1200 filters. It adds less than 10Kb to your SWF file size (excluding the mod itself of course), but more importantly the CPU impact is minimal. Christian has released it under the Creative Commons Attribution-Share Alike 3 (Unsupported) License, which basically means you are pretty much free to use it however you want, for whatever you want. It requires Flash Player 10, which at it’s current adoption rate of 76% and growing, shouldn’t be a big issue for anyone these days. I fully intend to integrate this with the FP10 branch of PixelBlitz. He also has a set of SoundSpectrum classes for generating beautiful VU meters (and also extremely useful if you wish to link the music to in-game events or effects). They are being tidied up at the moment, so hopefully they’ll be released soon. I’ll post about it here when they are. Feel free to download the zip file and have a play! Please comment here to let us both know what you create with it. Chameleons, Cupcakes & Sharks – Oh my! After the frenetic workload that went into my last game Kyobi, I needed a break from development. Add to this an insane pile of “real life” coding work and I was finding it really hard to motivate myself to get on with something new. Working until 3am in the morning day after day does that to me. Here are four very different games. 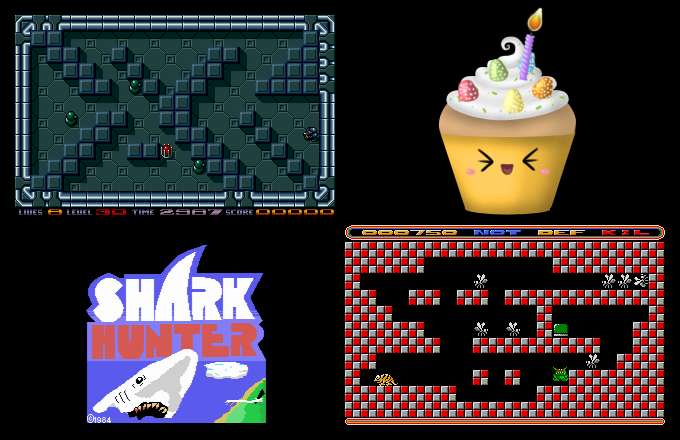 Top left is Robotz – a tactical / puzzle style shooter based on an Atari ST classic. Destroy the generators, this lets you destroy the robots (which are constantly chasing shooting at you). Destroy all the robots and the exit appears. It’s very simple, but actually really fun. The graphics are currently being pixelled for this, and I should have some level mock-ups to show next week. I’ve already done the level designer, mapped out 30 levels and have the soldier running around happily shooting at generators. Bottom left is Shark Hunter. This was an awesome 8-bit MSX game. You had to mend your fishing nets, while fighting off the sharks and try to survive a whole year. Another nice simple game mechanic, but it has stood the test of time well, and I feel it’ll convert into Flash with ease. And hey, who doesn’t like spearing sharks? 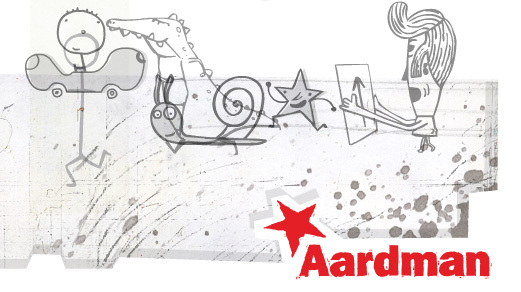 Concept graphics work for this is under-way, although no code has been written yet. Finally bottom right is a wonderful game that I loved on the ST. It was called Color Clash and was a PD game by Animal Soft. I doubt I’ll keep the same name as I don’t feel it does the game justice. You play the role of a chameleon who (as you’d expect) can change colour. Different colours have different actions. The yellow one can jump. The green one has a tail that he can flick to smash blocks / baddies. The red one inflates and floats and the blue one has a tongue that shoots out and can slide blocks around. I’m taking this core mechanic which works so well and tarting it up big-time. 40 levels have been designed already, and I’ve got the chameleon charging around the levels happily. Jumping, falling, sliding. Still need to do the baddie logic and colour changes. I want to do the original justice, but it also needs bringing up to date, so I’ll be refining and tweaking as I go. Still trying to track down the original author for his blessing on this project. Wish me luck. I am working on Color Clash and Robotz at the same time. I quite like having the two projects to swap between. The other night I was stuck in getting my chameleon to jump-slide properly, and rather than admit defeat (for the night) and fire-up Left 4 Dead, I hit Robotz instead and got the shooting rebounds working smoothly. I’m also finding as they’re both similar 2D styled games, that I can share quite a bit of the code between them. Always a bonus. The design I feel is a brave one. Created by Luis Cook it’s a clean fresh sheet of paper, where all the superflous items are resigned to shades of grey. And the colour of the beautiful imagery and showreels is allowed to stand out and be the centre of attention. Which on a site like ours is exactly how it should be.